Four-color process printed on Side 1 of uncoated 80lb White Smooth stock. 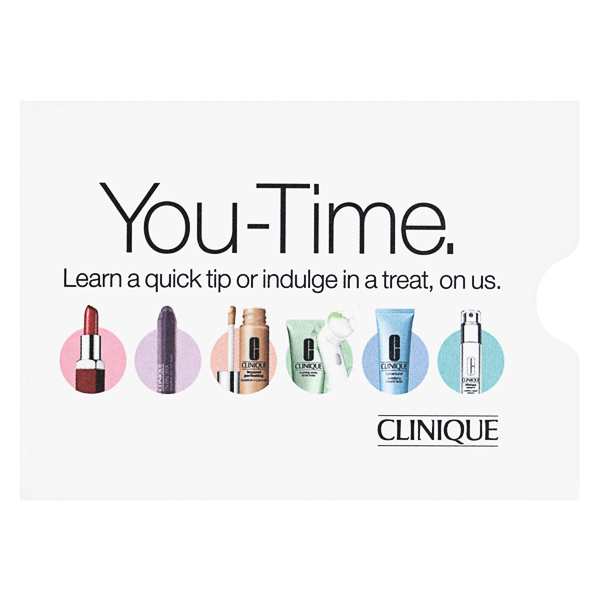 Renowned makeup brand Clinique encourages women to indulge in a little "you-time" with the gift card in this holder. Photos show an array of makeup and skin care products that come for free as part of the gift. Writing on the back panel invites women to visit a Clinique store to cash in their gift card. The design omits contact information, relying on clients' brand familiarity to help them find the closest location. 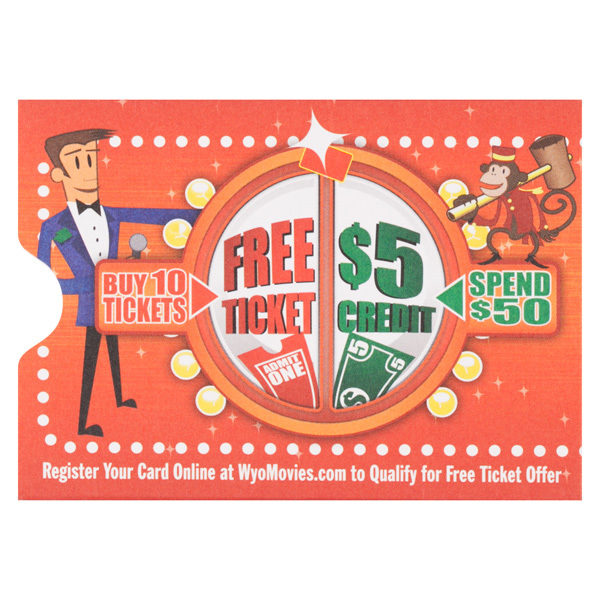 WyoMovies gives its customers this card holder to keep their reward cards safe and secure. A colorful cartoon graphic on one side illustrates the rewards customers can earn, while the other side tells them what is inside the holder. The red and yellow color scheme builds excitement and creates a sense of urgency. 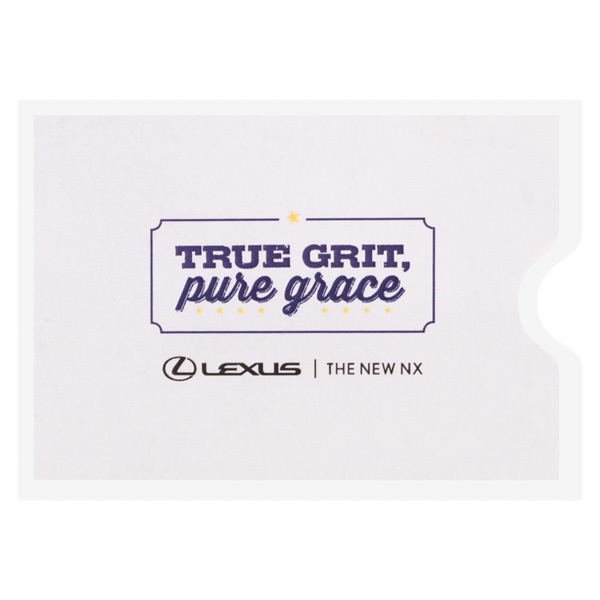 Lexus highlights its luxury and durability with this card holder. The phrase "true grit" looks strong in an all-caps serif font, while "pure grace" adds a feminine touch in an elegant script font. Both are in blue, which represents security. The Lexus name and logo add a hint of sophistication in black. Side 1 printed with 1 PMS color using light coverage on uncoated 80lb Yellow Vellum stock. The happy feeling of a receiving a gift card is heightened by this card holder’s bright, cheerful yellow color. 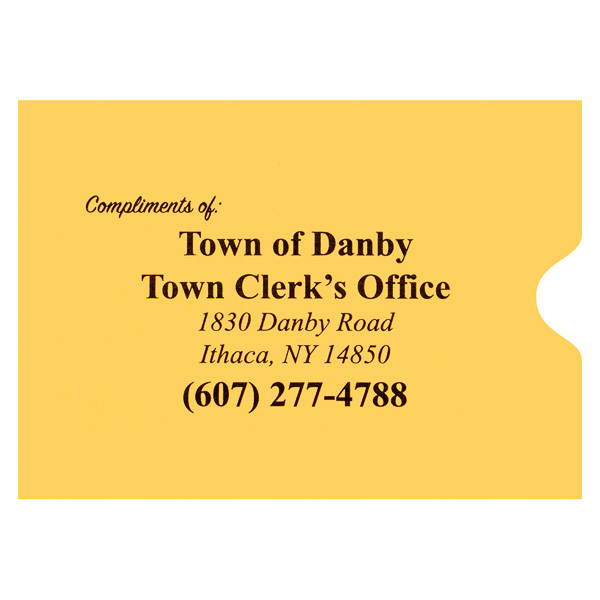 This simple design features the name and contact information for the gift giver, the clerk’s office for the Town of Danby. A script font adds to the design's friendly feeling, while the serif font in the name and contact information represents tradition and respect. This minimal product holds 3 1/4" x 2 1/4" gift cards, hotel key cards, and other small print materials in its full-coverage pocket, which is sealed on three sides to protect your cards from bending or wrinkling. Die-cut thumb notches on either side of the opening make it easy to lift the card out of the pocket. The product's simplicity extends to design options. Simply choose one standard PMS ink color to print your brand's name, logo, or other original elements on the panels, and your design is ready to go. You can also contact our Print Project Team to learn about imprint options that are available for an additional cost, including non-standard or additional ink colors, four-color process printing, and foil stamping. Print limitations apply: copy must remain 3/8" from all edges without bleeds. Dimension Closed: 2 1/2" x 3 1/2"